The Signal Multibeam Acquisition Radar for Tracking or SMART-S radar is a naval, all-weather medium to long range air and surface surveillance multibeam passive electronically scanned array 3D radar. [i] The SMART-S system has two operating modes, medium range up to 150 km and long range up to 250 km, making it a very versatile system in the field. It provides automatic detection, track initiation, and track maintenance of both air and surface threats, providing gapless coverage from the sea surface upward. [ii] Designed to be placed on all types of naval vessels, the SMART-S is able to employ electronic countermeasures to prevent jamming and can track up to 160 air targets and 40 surface targets simultaneously. [iii] The upgraded version, SMART-Mk2, includes a radar transmitter/receiver from Turkey’s ASELAN and has been exported to multiple navies around the world. 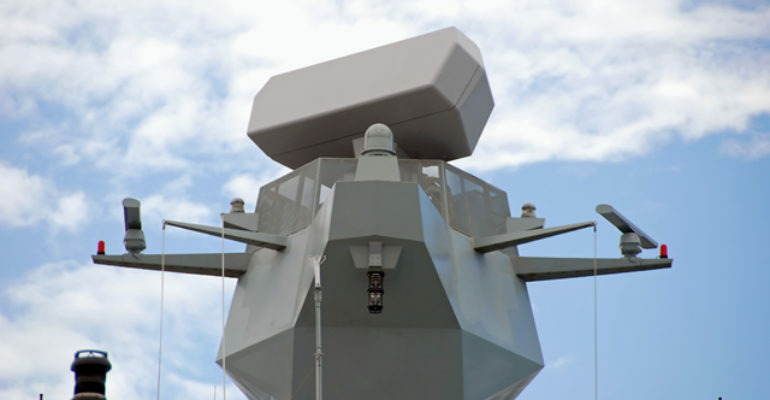 September 2014: Thales Nederland was awarded a contract by Lockheed Martin Canada to deliver SMART-S Mk2 radars for integration into Royal New Zealand Navy frigates. March 2007: SMART-S Mk2 radar to be installed on first Danish Flexible Support Ship. December 2003: The Royal Danish Navy orders two SMART-S Mk2 systems for its Flexible Support Ship Program. September 2003: Thales Nederland introduced the upgraded variant of the SMART-S, the SMART-S Mk2.